Quality of X-ray films interpretation by a flaw detector operator always bears rather a subjective character. Such factors, as qualification level of a flaw detector operator, their state of health, fatigue, sharpness of sight, limited evaluation capability, and also quality of the X-ray images (fuzzy boundaries, bad visibility, weak expressiveness of the defect image in relation to background etc.) render their negative effect. Welds quality assessment also requires execution of defined complex of metrological and calculation-analytical measures, which are hard to carry out due to absence of tools for realization of such operations. It is obvious, that the quality of flaw detection of welds depends to a large extent upon qualification and skill level of the experts in the given area. Proposed is method of implementation of computer technologies in area of X-ray flaw detection of welds, as a way to solve each of the above-stated problems. Creation of auxiliary service functions. The films received by flaw detection experts should conform to the requirements of standards on image optical density. The input of X-ray film in the computer and received image quality is determined by technical possibilities of the available equipment and focuses on obtainment of the picture image in the computer, which, together with the accompanying information, is put into the database. Image processing starts with the analysis of sensitivity calibration standard analysis/measurement. Standards, used in practice, have various types . To each type of standard, particular approach at image processing is required. As an example, the groove-type standard is given, as a most widely used one at X-ray films control in the CIS-countries. Figure 1 depicts the image of standard as per GOST 7512 and Table 1 - its sizes. Fig 1: Groove-type standard as per GOST 7512, where 1,2,3,4,5,6 - grooves. Figure 2 gives computer modeling of side views of calibration standards, which are far from corresponding to their image as per mentioned above GOST, which provides occassion to certain speculations. The possibilities of computer image processing, on one hand, help in solution of the task of picture calibration and definition of its sensitivity, but, on the other - raise a number of questions on how and what an expert views evaluating standard. Fig 2: Computer simulation of groove-type standard "in section" on gray level value on X-ray film. As clear from figures 1 and 2, it is very difficult to judge visually on reliability of the information represented by standard, and, moreover, then to do any evaluation of defects on a film. To solve such problem in an efficient and timely manner without computer facilities powered with appropriate program processing appears practically impossible. Film calibration can be conducted by indicating to the program unit under standard image its extreme angular points. Sensitivity can be defined by the program, as the least depth of a groove, detected on a film, on the indicated longitudinal axial line and calculated according to GOST 7512 . After that, its image is modeled in horizontal projection and probabilistic values calculation of the standard surface, which should have been received on the film, takes place.Figure 3 gives visual representation about the obtained calculated standard imposed on computer-simulated image of standard. 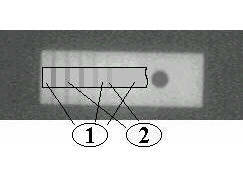 If forcefully to place on film (figure 3) calculated background level against standard, it is obvious, that the latest groove will not be visible. As practice shows, deviations of calculated values of gray levels from those eye-perceived is observed on majority of films. Calculated standard, imposed by such method, will always fit in average range of relative error, available on film. Fig 3: Actual (1) and calculated (2) allocations of gray levels against standard (3). Fig 4: Standard and part of image simulated thereupon. Zone (1) of calculated surface of standard everywhere has identical grey level. Zone (2) - grooves of standard. Proceeding from true dimensions and standard image on the X-ray film itself, a conclusion on information reliability, on the basis of which a flaw detector operator assesses a film, is made. Having input datas of brightnesses of standard points and analysis data for simulation of calculated standard, it is possible to model the image of standard, which should be reflected on a film. A variant of such simulation is represented on Figure 4. There is a problem - simulated area of surface of standard in a zone of the first groove "lighter" than surface of standard in a zone of the last groove (Figure 4). Typical example of human perception of image not absolutely corresponding to that reflected on a film. Analysis of gray level of restored surface of standard shows, that it is everywhere identical. In the given situation comes into force the psycho-physiological law of Weber-Fechner, according to which distinction in visual perception/sensation at examining of two surfaces with various brightness is directly proportional to contrast of brightnesses of these surfaces . Our perception is deeply affected by imaging gray levels of standard grooves, base metal background on a film, sharpness of sight and other factors. What do we see on films and how can we evaluate the information represented by standard without the appropriate equipment? How to incorporate the psycho-physiological law of Weber-Fechner at film interpretation? Fig 5: Results of interactive analyzer programs operation. Having as the analyzer the computer with appropriate software, a flaw detector operator can conduct evaluation of welds not on "as-it-is", roughly basis, but armed with defined data on grey levels in any point of a film, operative information on sensitivity, scaling relative error percentage coefficients. As additional service function, it is possible to request allocation of fluctuations of background level of base metal, to simulate 3D image of actual and initial standards. Figure 5 presents example of how interactive analyzer operates. A film, treated previously on the analyzer, is judged on fitness for further computer processing. With such fitness of a film, it is feasible to carry out transition to computer search and analysis of defects. Creating the block of programs for search and selection of defects boundaries, we recognized that a flaw detector operator should independently define weld area on a film with adjacent by-weld zone. The created algorithms of analysis, search and description of defects boundaries represent the most complicated block of program units, due to many inconsistencies between received data on a weld and visual observation of welding defects, where all negative features of human visual perception are revealed . The study into brightness characteristics of X-ray films obtained at industrial entrprises, has shown, that homogeneous (at subjective perception) base metal background of films, square 1 cm2, is perceived by computer as a collection of various grey levels, the range of which gradation makes 6 - 14 % out of the whole range of grey level values of colour graphic pallet. On a "homogeneous" section of the greater square the fluctuation range of grey gradation can make 20 - 30 % of graphic pallet range. With such "scattering" of grey gradation, application of image filtering for search of weld and defects boundaries does not provide reliable positive outcomes. Therefore, for solution of this problem, we elaborated algorithms for recognition. The algorithms for search of welds are designed on the logical analysis of grouped on brightness parameter characteristics of neighboring points of allocated film fragment. With such approach followed, determining weld boundaries is possible, which frequently can merge with base metal background. For search of defects some various algorithms are developed. The comparison of outcomes of their operation enables to define location of defect in a matrix of a selected film fragment. The boundaries of the found defects are described on a chain coding principle. Fuzziness of the images and the absence of precise boundaries results in necessity of calculation of the most probabilistic boundaries of the found defects. The found defect should have positive coefficient of visual perception. Ksr. - correction factor depending on brightness of a film background. As experimental running of programs shows, reliability of selection on visual perception coefficient, calculated as per indicated formula, makes 75-80 %. Calculation based on a more complex technique increases reliability up to 90%. Values of visual perception coefficient Kr. permit for a flaw detector operator to evaluate reliability of described boundary, as a defect, at low contrast of squares of the outline and surrounding. Program search and selection of defects allow to study in detail each described defect. For this purpose, the grid chart is superimposed on a selected search area and the defects are "marked" according to their initial values of coordinates. The values of obtained defect parameters are mapped in the special information window. The additional service functions allow to increase the size of the image of selected defect, to examine it layerwise "in section" both on axes X and Y. It is possible to model 3D image of defect at its symmetric conditionally layout depthwise (axis Z). At separate command, indication of special parameters, such as the Weber-Fechner coefficient, calculated coefficient of visual perception, average brightness of defect, average brightness of defect surrounding, overfall of brightness in defect, overfall of visibility, threshold of defects search, is also possible. The definition of the linear and depth sizes of the found defects, their squares, perimeters, location, and also straight-line characteristics of weld itself does not represent large complexity. The transition from pixel sizes to the real sizes is made by recalculation on calibration coefficients obtained earlier. Another problem is identification of types of the found defects. A simple, minor defect, e. g. in the form of single round pore in a raster format, represents a figure at best close to a rectangle. The more complex single defects are described as polygons of arbitrary configuration. Lack of fusion, perceived by a flaw detector operator as an extended continuous object, can be detected by computer as a collection of objects with intervals. If there are congestions of pores or slags, they, being superimposed against each other in the plane image, give the resulting object of the very complex geometrical form. The program, by logical analysis of defects characteristics and their localization in a weld, with application of methods for selection of simplier defects from the complex ones, identifies with certain probability such defects, as pores, congestion of pores, slag, congestion of slags, lack of fusion and crack. However, final identification of defect type is kept at expert's discretion. A flaw detector operator in interactive mode can change the type of the defect, found by the computer, or in general to remove detected defect from the defects list, according to which weld quality is concluded, if they considers this defect being a film defect, not a welding defect. However, the initial picture of the defects, found by the computer, will be all the same stored in the database. Figure 6 shows results of recognition and analysis of defects. Fig 6: Outcomes of operation of programs for recognition and analysis of defects. 2D vertical section and conditionally symmetric 3D image of the selected defect. Obtained in such a way defect information is transferred to the database of welding defects and serves as a source for weld quality assessment by matching the sizes of defects with acceptable values on normative documents . At weld quality assessment, with the purpose of revealing the possible reasons for defects origin, statistical analysis is indispensable, with the help of which it is possible to evaluate effect of the various reasons leading to defects emergence. To define weight coefficients, discriminant analysis is used. On obtained weight functions for each reason of defect, it is possible to evaluate welds separately and by sampling. On the basis of evaluation outcomes available, it is possible to judge about drawbacks in the welding process at the given object/enterprise or organization, and, accordingly, to produce the recommendations for attaining required quality of welding operations. Cooperation with NDT laboratories at Mozyr Oil Refining Plant has enabled us to advance considerably in problems tackling related to represented technology. As practice reveals, representation of the given development at international conferences and exhibitions, evokes interest not only among flaw detector operators, but also, as consulting system, among experts in the field of quality system assessment. II. Instruction Complex for Training of Experts in X- and Gamma-Ray Flaw Detection. Application of computer facilities in flaw detection is viewed not only as creation of the tool permitting to automate routine of a flaw detector operator. The representation of the given development in the field of computer technologies is an implying consequence from the system for computer analysis of welding defects. Quality degree of welded joints and training of the experts in flaw detection are directly interconnected. Therefore, education and certification of competent experts in flaw detection is the important direction in quality control system in welding production. Naturally such complex should have be adapted to the existing system of preparation and certification of the experts in X-ray flaw detection within the requirements of domestic and international standards. In the Republic of Belarus the standard EH 473-95 (the exact analog of EN 437:1992) is normative documentation establishing the requirements to NDT staff qualification. The amount of information for mastering knowledges and obtaining of skills is rather great, and it is difficult-to-reach and incomrehensive in majority of cases. The quick references, where the data on each section are concentrated, are hard to find, and are related to specific kind of technical and scientific literature. The use of computer databases (DB) gives a defined number of advantages: DB can contain in full content all required information, which is stored as long as needed, and also amount and content of the information can be changed at any moment at no additional effort or cost. Beside theoretical skills, a flaw detector operator upon learning should practically know how to adjust the equipment, to draw technological charts on radiographic inspection and to interpret X-ray films, which is achieved by extensive training. The direct operation of the equipment is necessary to gain respective skills. What concerns other skills, advantage of using computer facilities in perfecting the process is obvious. Emulation of the process of technological control compilation with possibility of operative access to help information from DB, makes it less labour-consuming and more regular. The most responsible stage at realizations of control - interpretation and identification of defects on an X-ray film. Special attention is given to this problem at development of instruction complex. All experience of creation of the system for recognition and analysis of welding defects is taken here into consideration. Above in the text it was pointed out, that flaw detector operators are prone to making mistakes at definition of both types of defects and their sizes. However, experienced flaw detector operators show much lower error percent. Wide experience of operation and training counts. The program - trainer/simulator, conducting training at learning, is entered into complex structure. There is also a program imitating the process of film interpretation. "X-ray films" contains the images of X-ray films with typical defects, samples of the and films for testing. The database "Trainees" contain full information those passing or passed learning, and outcomes of examinations. The electronic storage of the information will allow to simplify, both for trainees and teachers, access to necessary data, which, alongside with possibility constantly to enlarge, change DB contents, is a significant advantage in comparison with present information media (quick references, text-books). The extended possibilities of trainers will permit save time and material resources on obtaining of necessary practical skills by flaw detector operators. On Figure 7 the fragments from the program of instruction complex are represented. Fig 7: Fragments from the program of a learning complex. To evaluate knowledge of the trained, subprograms for examinations are included into the complex as per EH 473-95. At examinations, elimination of human factor ensures objectivity. The availability of the similar system without the examination block in each falw detection laboratory at constant scheduled self-preparation of the experts will allow at a proper level to support qualification of the NDT experts. In conclusion, authors would like to acknowledge active support and involvement Certification in Radiographic Inspection "PROFCERTICO" from the Belarussian association NDT. The proposed computer technologies solve only part of the problems of x-ray testing automation. However, there are a number of important problems, which require contining of the research with additional money and effort inputs. Unfortunately, the authors are currently unable to continue the work due to unavailability of the required funds and research equipment. Sheleg V.K., Denisov L.S., Kapustin A.E., Bardusova I.I., Kolosov V.V. "Zautomatyzowana Obrobka wynikow kontroli radiograficznej", BIULETYN institutu spawalnictwa w Gliwicach, Nr. 3 1999. Poland. Rumyantsev S.V. "X-ray flaw detection", Moscow Atomizdat, 1974. 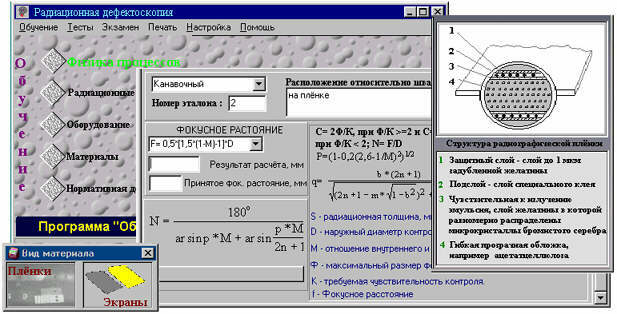 Sheleg V. K., Kapustin A.E., Fokin A.P., Volokh D. V. "Computer evaluation of X-ray films fitness on the basis of sensitivity standard analysis", Welding and Related Technologies, # 1, Minsk, 1998. Dobromyslov V.A., Rumyantsev S.V "Radiation introscopy", Moscow, Atomizdat 1972. S.V. Zvereva "In the world of solar light" Leningrad, Gidrometeoizdat 1988. Sheleg V.K., Kapustin A.E., Bardusova I.I., Kolosov V.V., Volokh D.V. 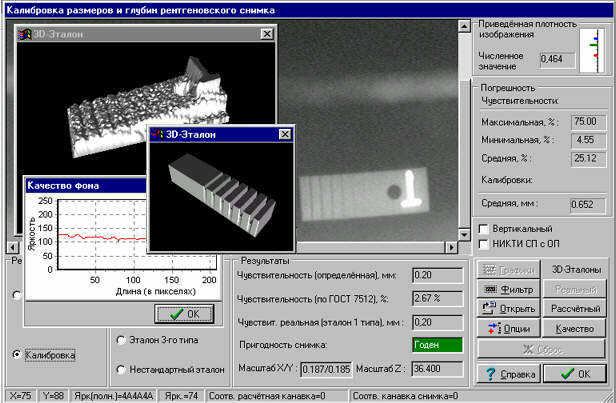 "Computer analysis of radiographic images of welds" Second International Congress "Mechanical engineering and Technologies'99, Jan VI, Volume 7, September 1999, Sofia, Bulgaria.